Your project can contain many characters and props. When characters are placed together in a scene, notice that they may be various sizes; some will be too tall or too small, the character's size may vary from one scene to the next. 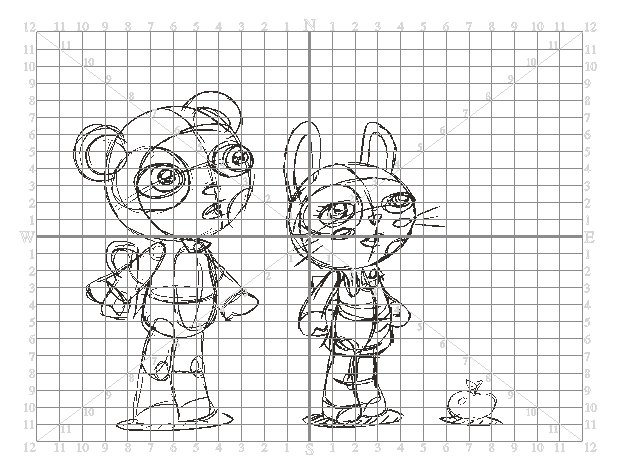 You may also find that when a character is scaled down using the Animation tools, its outline is thinner. Sometimes, the outline may be so thin that the difference between the resized character's outline and the outline of the original un-resized character is quite noticeable. When you design characters or props, keep in mind how they will look together. The grid can be displayed in the Camera or Drawing views. This is useful when determining the proportions between characters and props in a scene. ‣ From the Grid Control toolbar, click the Show Grid button or select View > Grid > Show Grid. ‣ Normal: Sets the grid units to squares. You can also select View > Grid > Normal. ‣ 12 Field: Sets the grid units to rectangles for a 12 field grid. You can also select View > Grid > 12 Field. ‣ 16 Field: Sets the grid units to rectangles for a 16 field grid. You can also select View > Grid > 16 Field. By default, the grid is displayed as an underlay so it appears behind the drawings. If you prefer it to appear in front of the drawings, you can display it as an overlay. 1. In the Grid Control toolbar, click the Overlay button or select View > Grid > Overlay. When the button appears pushed in, the grid is displayed as an overlay. 2. In the Grid Control toolbar, click the pushed-in Overlay button or select View > Grid > Underlay to switch back to the underlay grid display mode. You must be working in the Camera or Drawing view when setting the grid options, otherwise the Grid Control toolbar and the related top menu commands will be greyed out. When working in the Camera view, the grid is only displayed if a Drawing tool is selected.